The oldest continually operated gas station in the United States is not along the historic freeways of California, or sitting on the slowly eroding Route 66 somewhere in Arizona. 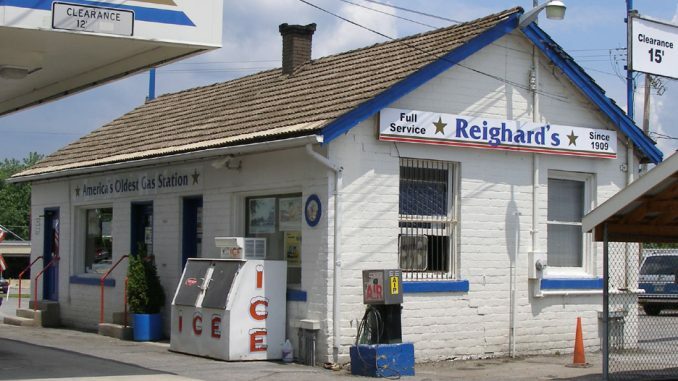 A little service station called Reighard’s opened in 1908 in Altoona, Pennsylvania, the same year Henry Ford debuted the Model T. Reighard’s gas station started as a small blacksmith’s shop in the late 1800’s and was operated by George Hinkle. In 1908, seeing the increased numbers of horseless carriages coming out of Detroit, Michigan, Hinkle decided to try his hand at the gasoline business. Opening the small service station, he operated it himself till it was sold to George Reighard in. In 1978, Martin Oil Company took over the business and has operated it ever since. Constructed of cinder blocks with a roof of hardened concrete shingles, Reighard’s gas station has changed very little over the years. With new pumps being added as the times required them, the full service station still offers to clean your windows of check the oil when you stop in for some gas. Numerous old photos line the inside of the station showing how it has changed over the years.